I took the opportunity to ask for our MP's support in getting the Government to speed up the introduction of the EMC Directive in to UK law. The revised EU Directive on Electromagnetic Compatibility (2014/30/EU), came into force on 20 April 2016. This Directive requires all electronic products to have a successful conformity assessment before being placed on the European market. RN Electronics has sought support from the EMC Test Labs Association and our local MP in seeing this Directive being brought into UK law. It has now been confirmed that this will be the case from 8 December 2016. 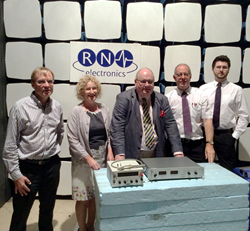 When our local Member of Parliament took up our offer to visit our EMC test laboratory to discuss the implications of Brexit on the UK electronics industry back in July, RN Electronics were unsure just how Sir Eric Pickles MP would be able to help. Immediately following his letter, Statutory Instrument number 1091 was laid before Parliament and only three weeks later, on 8 December 2016, becomes UK law as the Electromagnetic Compatibility Regulations 2016. These regulations transpose Directive 2014/30/EU of the European Parliament and repeals and replaces Directive 2004/108/EC relating to Electromagnetic Compatibility. RN Electronics can offer EMC testing in accordance with the new Regulations to support CE Marking of customer products. RN Electronics is a UKAS accredited EMC testing laboratory (no.2360), based in Brentwood, Essex, offering traceable testing of electronic equipment to EU and international standards.